This year was Joel’s year. Despite difficulties in the past, this year Joel was going to complete the infamous California Death Ride. I got a chance to ask Joel a few questions about his experience. Here’s what he had to say. What was your motivation for taking on this challenge? More specifically: I tried this ride in 2009, and didn’t complete it. The Death Ride consists of five mountain-pass climbs over 129 miles, and the first time I tried it, I only completed the first 3 passes. I wasn’t happy about that, and I wasn’t going to be satisfied until I rode all five passes. However, I’m something of a workaholic, and in 2010 and 2011, I was too absorbed in my job to train sufficiently. This year, I decided I had to go for it–I didn’t like it hanging over my head–so I made it my number one personal goal for the year. How would you describe how grueling the ride was? Well, I should start by saying that I’m not a particularly strong hill-climber, and the Death Ride is a climbing event. So it’s an especially tough ride for me by definition–which adds to the silliness of the dare. Anyway, the way the course is laid out means that, for the first four passes, riders spend their time either climbing or descending. There’s very little flat, and it’s not a matter of many little hills, it’s all about climbing at perhaps 7-8% grade for 10 miles at a time (see the course here: http://www.deathride.com/elemap.html). I suppose an indication of the difficulty is that the riders tend to be quiet. In contrast to an event like the AMBBR 100-miler (incredibly fun ride in Tahoe each June), where people are chatting as they ride along, in the Death Ride, much of the time everyone is just heads-down, silently pushing their gears. It’s a little eerie, especially in the early morning. For most riders, the first four passes take up the morning. In early afternoon you drop down into the river basin and ride about 20 miles of rollies before you start the last climb, which is also the longest in terms of distance. Because it’s afternoon, it’s hot, and since you’re not on mountain roads, there’s not much shade, and it’s typically a bit windy, and of course you’ve been riding for awhile, so you’re tired. All of that makes the last pass pretty tough. I saw a few riders still looking fresh and strong by that point, but most of us were just slogging our way to the finish. Any fun aspects to the ride? #1 The descents are incredible. 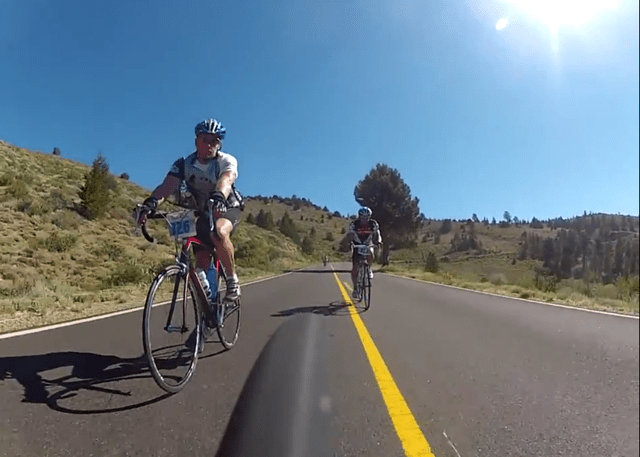 Unlike the local climbs which involve a lot of tight blind turns that can make descending treacherous, these descents are on wide closed roads, and they last 10 miles of steep! 50 mph is easy to achieve, and not hard to control. The descents are almost worth the climbs! #2 The first climb is from Markleeville up to Monitor Pass. From there, in the morning sun, you can look down to the east to highway 395 and Nevada. That view from the top, combined with the feeling that you climbed there under your own power, is tremendous. How did you change your training to learn from your previous experiences? #1 During my training in 2009, I used one brand of electrolyte drink, but then changed to another just before the event. During the event, the new drink made me nauseous, so I didn’t drink, and unsurprisingly I suffered extreme cramps in my quads, and had to stop at the top of the third pass. I believe that was my biggest mistake. This time, I tried different drinks and foods early on, then settled on what felt right and didn’t change a thing. #2 I rode more hills. 😉 I kept working on hills until I could ride 7-8% grades without continuously thinking about getting to the top. Instead of thinking of a hill as a short pain to conquer as quickly as possible, I tried to get to the point that hills were just like flats, except that for some bizarre reason you had to push harder than normal. And you just had to keep pedaling. How did your training at FIT help you? #1 Thom and Scott like to create workouts for me that I’d really rather not do. If I was working on my own, I wouldn’t work that hard. And then they keep me laughing at myself, and keep challenging me, which has helped with the “just keep going no matter what”. Back in the Pleistocene era, I used to run 10ks and duathalons fairly often. Just an age-grouper, but I always enjoyed those events. I let that level of fitness get away from me because I worked too much, but I’ve been sort of hoping to start running again, and resume events like those. And as a stretch goal (it’s a stretch because I swim like a rock), I’ve started working on swimming…and maybe someday I’ll do some triathlons. What would be your advice to anyone considering taking on an endurance challenge? #1: Don’t just blindly “work out a lot,” rather make a plan that relates clearly to your goal. Think about how achieving your _training_ goals is preparing you to achieve that _event_ goal. #2: Keep in mind how important psychology is, in addition to physiology. Keep track of your progress, and build your store of confidence by recognizing your achievements during training. You’ll need that confidence during the event. #3: Remember that if you don’t succeed the first time, you’re just going to have to do it all again ’til you do succeed…so you might as well give it your best effort that first time! Wise words, Joel. You’re an inspiration to us all.